Trance. House. Techno. And plenty of reggaetón (the super-charged blend of American and Latin hip-hop and rap). If you love to dance, these words are music to your ears, and this is the music you'll hear at these three San Juan nightclubs. And if you're looking for a more relaxed environment, check out San Juan's lounges instead. The El San Juan Hotel & Casino is a top nightlife destination even without the added bonus of a club. But it happens to have one of Puerto Rico's hottest nightlife destinations in Club Brava. A popular haunt for tourists, locals, guest DJs, and even the occasional celebrity, Brava justly gets packed to bursting point on weekends. With a crowd that's energetic, scantily clad, and generally representative of the city's pretty people, you'll be happy you came to mingle, jiggle, and lounge at Brava. To get here: The hotel is located in Isla Verde, a short cab ride east of Old San Juan when there's no traffic, a potentially much longer drive if there is traffic to the old city. The club is located in the lobby of the hotel. To make a night of it: The El San Juan can easily be your destination for the evening. The lobby lounge is a great place to hang out and people watch to your heart's content as you sample a few cocktails. From there, you can head to Koco for an excellent Caribbean-themed dinner (heavy on the coconut) and then line up for the club. After, spend some time at my favorite casino in San Juan. Straddling the line between Condado (the chic district where some of San Juan's trendiest hotels and restaurants are) and Santurce (a Bohemian, blue-collar neighborhood with a distinctly local feel) is Club Kronos. Complete with laser lights, a large dance floor, and minimal decor, it's all about the music and the crowd here. To get here: The club is located on 192 Segara Street, close to the Baldorioty de Castro Expressway that leads to San Juan from the airport. It's an easy cab ride from most hotels in Isla Verde and Condado. To make a night of it: Club Kronos isn't too far from La Plaza del Mercado, or La Placita. This square is a market by day but on weekends and Thursday nights, it becomes an open-air party, with restaurants and bars enjoying a lively trade. Dine at one of the many great options here, and chill out until you're ready to hit the club. La Rumba bills itself as the only floating nightclub with a full-service bar. The club leaves from Pier 1 in Old San Juan and heads out into the bay, with lights, music, and the old city serving as the backdrop. It currently only operates on the weekends. (Kids are allowed, so it's not exactly an adults-only club.) There are three trips a night, beginning at 10:30 on Friday, 9:30 on Saturday, and 7:30 on Sunday. To get here: The boat is docked at Pier 1, right on Plaza Dársenas at the foot of Old San. 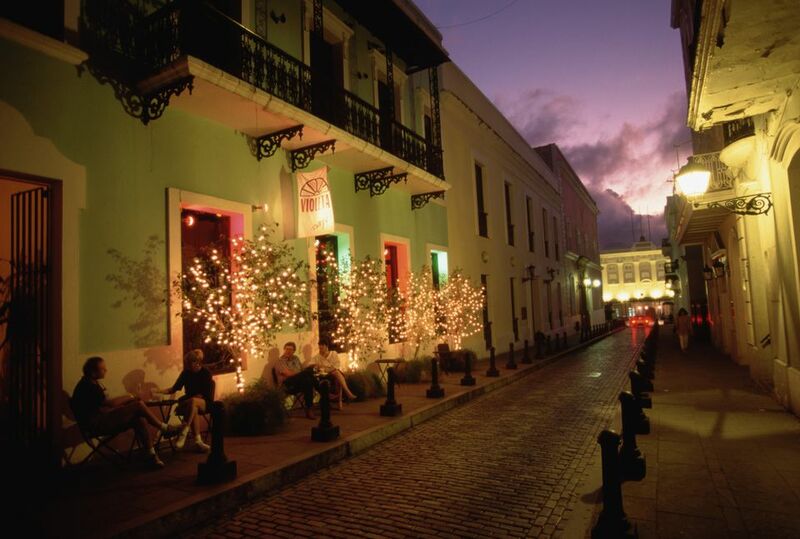 To make a night of it: With all of Old San Juan at your disposal, you can enjoy a stroll down Paseo la Princesa to the lovely Raíces Fountain or enjoy dinner on South Fortaleza Street, which is close to the piers and offers some of the best dining in the old city. From either spot, you're a few minutes walk from the pier.